← This looks like a winner to me. Thoughts from a wet and windy Welsh hilltop. I cannot remember such a long period when the weather has been so discouraging for the outdoor photographer. Days….. weeks!….. on end of cloud, rain and gales – and today is no exception. I’m shocked to discover that I’ve barely taken a decent photograph since the beginning of October. But I can’t just blame the weather for that. In my last post I wrote how my priority over the summer was to work on images for new postcards. How one needed to visit the popular locations and somehow come up with something new. I eventually realised I was just going through the motions. I really was re-visiting the same old places and taking the same old photographs. So as much as the weather really has been disastrous it was a partly a conscious decision to lay the camera down and give myself a break. This happened to me big time about twenty years ago. I put down the break-up of a relationship partly or largely to the fact that I saw myself as a photographer first and a human being second. There certainly were other factors but being an outdoor photographer does involve leading a very unpredictable lifestyle. Whatever…..after a few self-imposed months of keeping the business running and no more – certainly no actual photography – I picked up the reins more or less where I had left them. In my experience one’s creative side continues to develop even if putting it into practice actually takes a back seat for a while. After a few months break from photography I’m sure – well, fairly sure -that I’ll return to it with a bunch of new ideas and attitudes. I hope it does, because I’ve recently had a very positive discussion with a publisher and author about a new book. There’s still plenty to be finalised, particularly the financial side of things, but I’ve come to the conclusion that my sanity is now more important than my bank balance! So even if it doesn’t pay very well, I’ll still do it. In a post earlier this year I wrote about how I missed an opportunity to photograph the Northern Lights. Since March I have gained a better understanding of why and how a faint aurora – even an invisible one – can actually produce decent photographs. The reason is this : there are two types of sensor in the eye – cones and rods. The cones are colour sensitive, but the rods, which are 1000 times more sensitive than the cones and far more numerous, do not pick up colour. So our eyes do not perceive colour at low light levels. The sensor in our camera is equally sensitive to colour at low or high intensities so it will record what the eye cannot see. A couple of evenings ago I received an “Aurora Watch” amber alert. To my surprise yet another cloudy day actually improved to an evening of clear periods and showers. There was quite a powerful moon but the northern skyline looked a bit odd. I couldn’t be sure whether it was a pale glow that I was seeing or some cloud hugging the horizon. 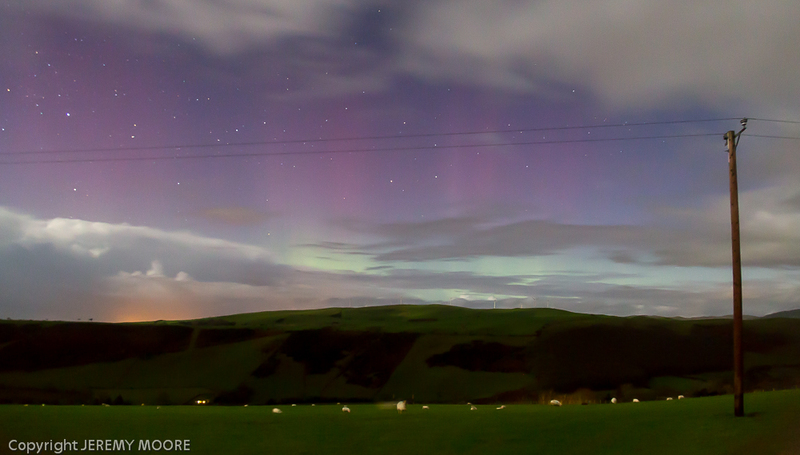 I eventually realised that I would have to take some photographs to be sure if the aurora was present or not. I set the ISO at 3200 and the meter gave a reading of 8 seconds at f4. When viewed on the camera’s LCD screen the first image immediately showed that there were vertical bands of purple in the clear sky which were completely invisible to the naked eye. I took a few more images to confirm it and then called it a day. On viewing the images this afternoon on the PC monitor it became clear that amongst the cloud on the horizon there had also been a green glow. The very localised orange glow on the horizon is usually visible to the naked eye as pale and colourless but the camera’s sensor has picked up its colour; it must be street lighting from a nearby village reflected off low-ish cloud. The image has of course been processed, but not to an excessive level – no more than I would expect on a typical landscape. This had been the real thing and without the camera I would never known! Technically and artistically it is rather poor. I should have taken more care with placing the tripod and weighing it down, and the telephone pole in the foreground is hardly an attractive feature. But I’m treating it as a learning experience and hopefully there will be an opportunity to do better in the future. Seasons Greetings to all from a wet and windy Welsh hilltop! This entry was posted in Uncategorized and tagged aurora, borealis, landscape, mid-wales, northern lights, photograph, photography, wales. Bookmark the permalink. 2 Responses to Thoughts from a wet and windy Welsh hilltop. Good effort, Jerry. There was just a bit of a show up here last night, I managed a few pics but need to be more organized next time. Hello David, nice to hear from you again. Yes there was a bit of a display here round about midnight as well. From what I and the camera saw of it, it was less colourful than Dec 20th. There was a bit of purple in the sky but not in vertical bands as pictured here. There was virtually nothing visible to the naked eye. it makes me wonder how many times I’ve gone out searching for the aurora, seen nothing and been disappointed; when in fact if I had photographed it, I’d have captured something.